The Gold Liberty Head Quarter Eagle is a solid gold symbol of America's glorious past. Its elegant design was created by Christian Gobrecht in 1839 and was used from 1840 until 1907. Inspired by coins from ancient Greece, it features a youthful Miss Liberty, wearing a coronet inscribed with the word LIBERTY, her curly hair pulled back in a bun and held in place by a string of pearls. Gobrecht'smasterpiece - which remained unchanged for 67 years - stands as the longest uninterrupted use of a coin design in the history of U.S. coinage. Today, most of these masterpieces are in museums or private collections and are nearly impossible to find. 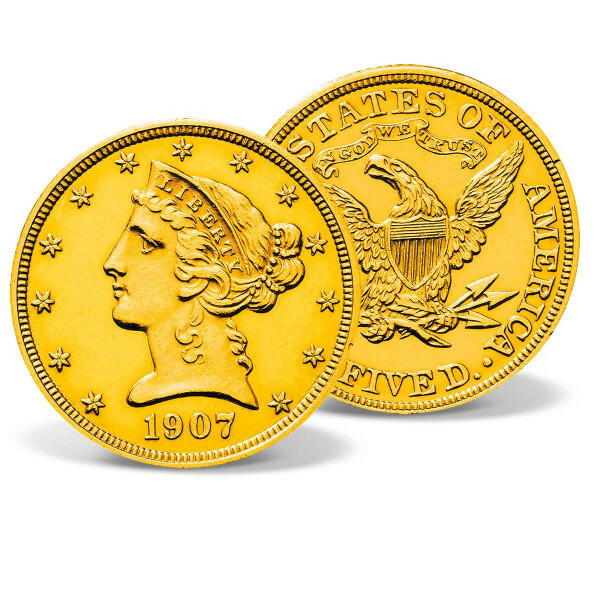 With its rarity, high gold content, the 1907 Liberty Head Quarter Eagle is one of coin-collecting's most coveted finds - and a treasure very few collectors get the opportunity to own. Now you can be among the elite group who have one of these very rare solid gold coins in their collection.